#1 is lovely and fresh with the two blue tones the shoes you went with look fine to me. #2 is lovely. The dark parts of the pattern in your skirt are nicely echoed with your sandals and you you just right for a hot day. The slanty photos look dynamic! Love those blue colors on you! I love 1 -- the gingham with the pants is excellent. I think those shoes look fine with it. I really like that skirt on you in 2, and the blue top goes nicely with it. 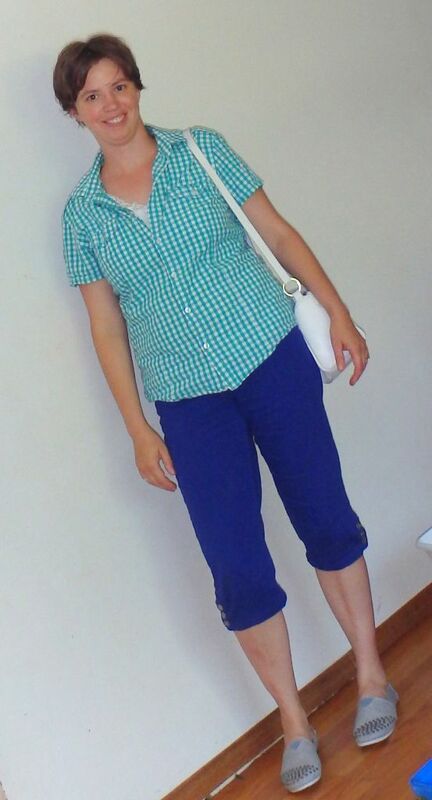 I so adore the turquoise gingham print paired with the cobalt pants, Ami, that's my favourite. 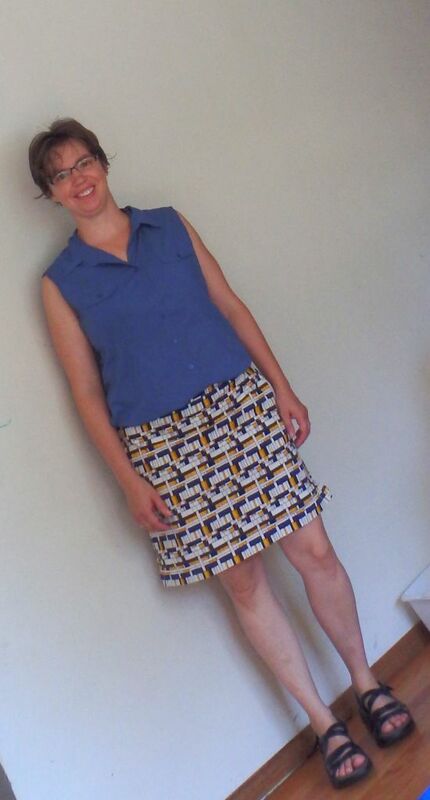 But the Mondrian skirt is very fun too, looks lovely with that shade of blue (which is super on you!). Blue is one of your best colors! I love #1 - and I think the shoes that you wore with it are perfect. You look so put together! 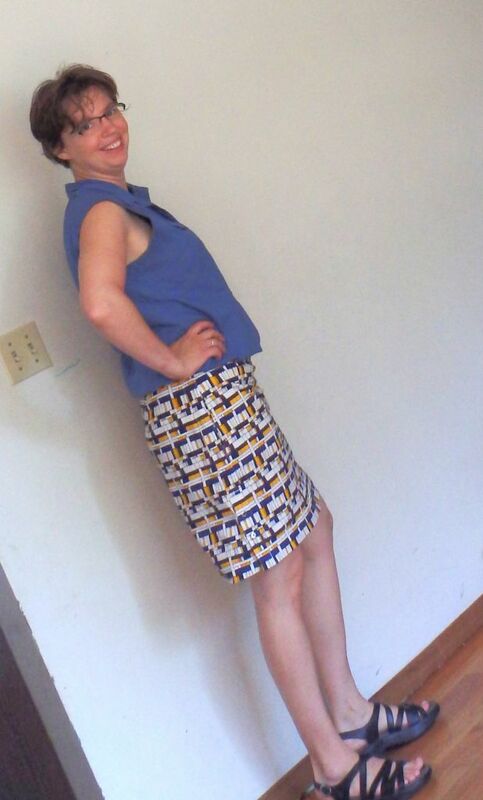 I also think that the shoes in #2 work really well with the print in the skirt - almost repeating part of the pattern. I just have a question about the blouse - is it tucked? semi-tucked? or cropped? I can't tell for sure from the pics - but when I looked at them, my first thought was wondering if you could make it hang a little longer in the back? You are really getting a good grip on your style - it works for you and looks effortless. Good question Marley - in the pics, the top is tucked. But I just looked down, and I'm wearing it untucked now - I thought the proportions were better in the mirror (besides that I dont' have to put in effort to keep it UNtucked). If I get a chance, I'll add a pic. Well, slanted or not, I love both of these outfits on you. They are fresh, summery, and bright, and look as cool as possible under the circumstances. Your nailing the casual summer style, Ami. These a fun loving, but polished and perfect for the activities that are filling your days. The fit and use of color is great! You look so nice and summery, love the colors! The skirt really caught my eye. Love the tilt, it reminds me of a tourist trap called The Mystery Spot, have you heard of it? Love those colors on you! I also really, really like the skirt pattern: Adult w/o being too stuffy, not twee but still a little fun. Ha! I totally relate to your situation. I especially love that blue top, skirt combination on you!